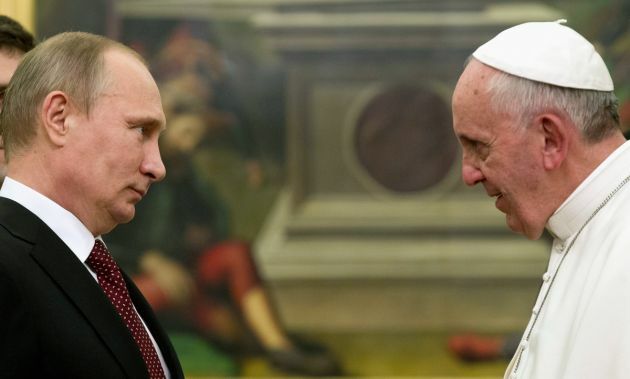 (Photo: REUTERS / Claudio Peri / Pool)Pope Francis (R) meets Russia's President Vladimir Putin during a private audience at the Vatican, November 25, 2013. VATICAN CITY (Reuters) - Pope Francis called for renewal of the Roman Catholic Church and attacked unfettered capitalism as "a new tyranny", urging global leaders to fight poverty and growing inequality in the first major work he has authored alone as pontiff. A meditation on how to revitalise a Church suffering from encroaching secularisation in Western countries, the exhortation echoed the missionary zeal more often heard from the evangelical Protestants who have won over many disaffected Catholics in the pope's native Latin America. Stressing cooperation among religions, Francis quoted the late Pope John Paul II's idea that the papacy might be reshaped to promote closer ties with other Christian churches and noted lessons Rome could learn from the Orthodox such as "synodality" or decentralised leadership.